Very special release indeed, the return after more than 40 years to the piece that first brought him worldwide fame. 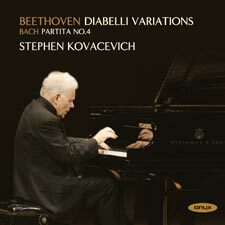 In the 90s Stephen recorded the complete Beethoven Sonatas for EMI for the first time, and the set is one of the standard recommendations. This recording completes the cycle, which for Kovacevich has become a true life-cycle, having given his sensational Wigmore Hall debut with this piece in 1961 and recording it in a still-classic version for Philips in 1968. His conception has changed – it has a more live quality (despite being a studio recording) and more dramatic - quite simply it’s picks you up and sweeps you along irresistibly to the very end. Some of the most profound Beethoven playing ever put on disc! As a generous bonus comes his first ever Bach recording, a concert favourite of his, Bach’s Partita no 4 which provides a wonderful palate-cleanser after the emotional rollercoaster of the Diabelli! Release timed with Stephen’s International Piano Series recital of the Diabelli at the QEH on January 26.